Roxane White (pictured) and MCPH Executive Director Jeff Kuhr went over Child Care 8,000 at the Oct. 10 Quarterly All Staff Meeting. Visit health.mesacounty.us/child-care-facilities to learn about this project that's underway in our community! 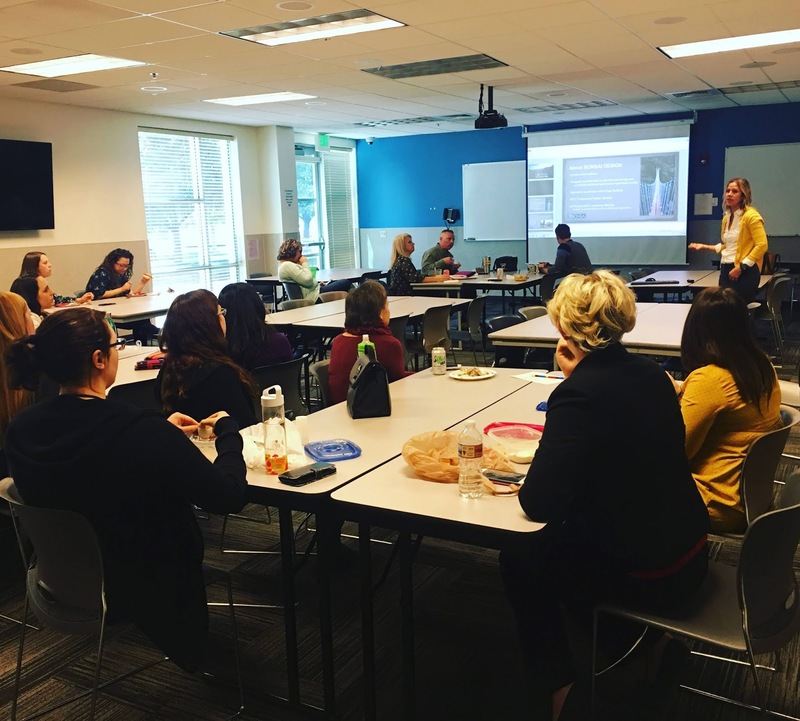 Sarah Shrader of Bonsai Design gave a Lunch 'N' Learn to MCPH staff this week. Sarah told us about the changes coming to Las Colonias Park. Visit riverfront.gjep.org to learn about this incredible project happening in our community! Looking for fall foliage? 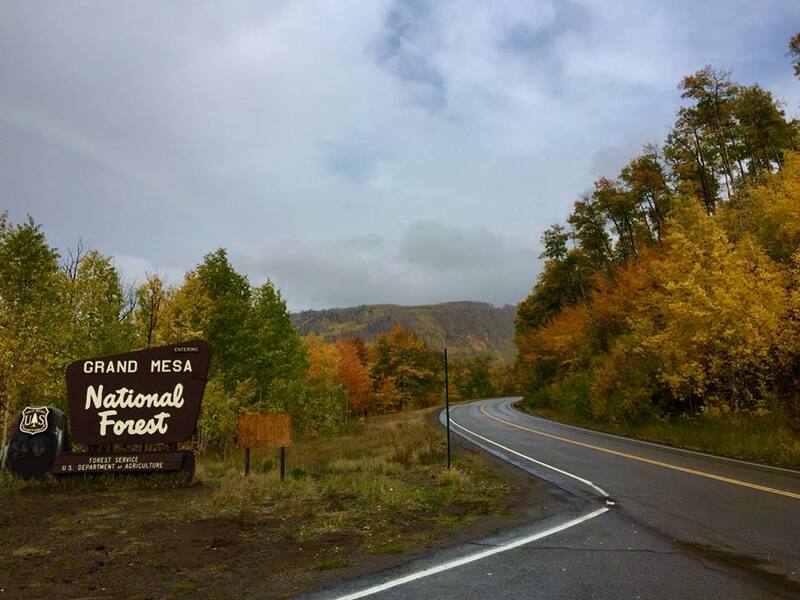 The Grand Mesa is just bursting with color right now. 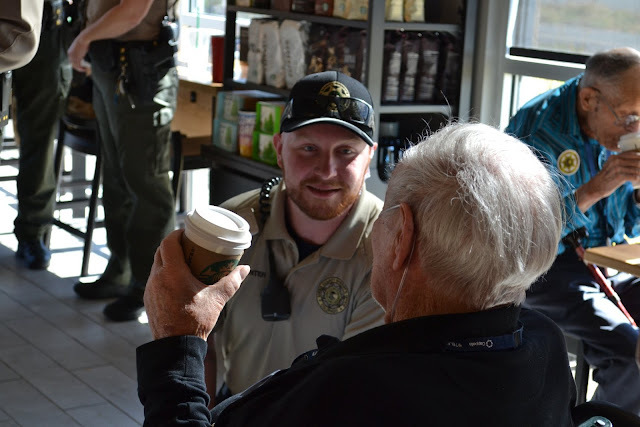 Thanks to our Mesa County Sheriff's Office rural area deputy for this spectacular photos! The Mesa County Sheriff's Office hosted a Coffee with a Cop event Oct. 3. They met with community members and had meaningful conversations. 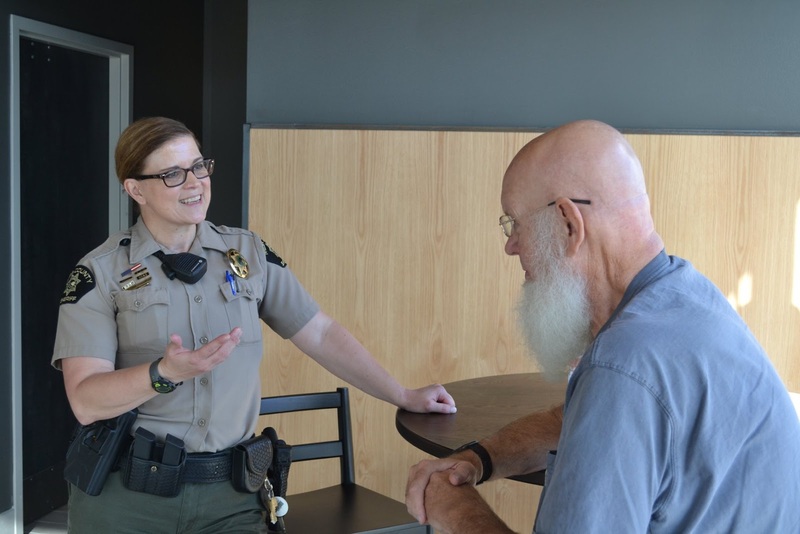 MCSO deputies have conversations with residents at a Coffee with a Cop event hosted at the Clifton Starbuck's. This picture was taken on Oct. 4 of the storm moving into the Grand Valley. A MCSO deputy captured this image while in the 25 Road desert area. Snow anyone?! This photo was taken Oct. 8 on Lands End Road near Carson Lake, on the Grand Mesa. 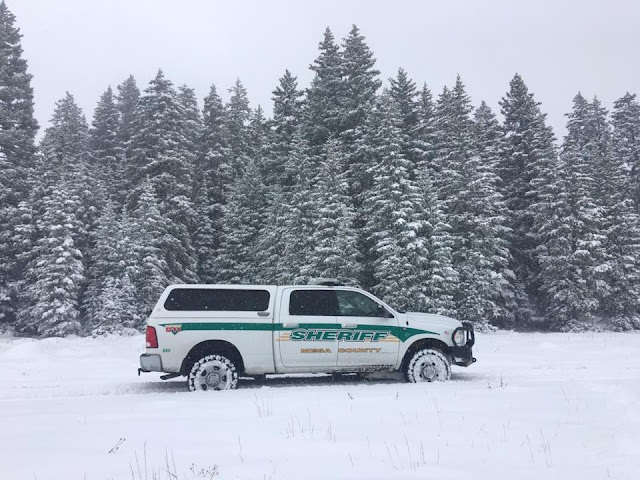 A MCSO deputy reported about 8-10 inches of snow was on the ground! 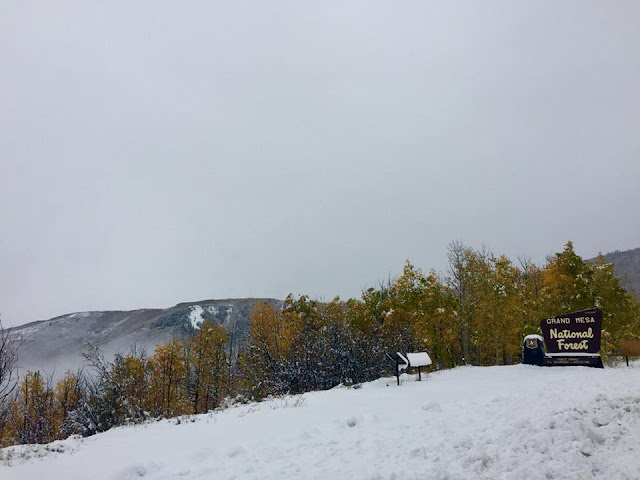 On Oct. 11 there was about 2-feet of snow on top of the Grand Mesa. These pictures were taken Thursday near Skyway by a MSCO deputy. Scott Forsgren (second to the left), retired fleet supervisor, stopped by the Mesa County Road and bridge shop to say hello. Office Administrator Heather Conder, left, always makes sure everyone has enough to eat. Road Supervisor Rudy Bevan gave an update while public works crews enjoyed biscuits and gravy at an appreciation breakfast Wednesday morning. Mesa County Employee Association (MCEA) Board Members (left to right): Lisa Snyder, Secretary; Donna Redd, Vice President; Heidi Belatti, President; and Rene Romero, Treasurer. MCEA attended Public Work's Appreciation Breakfast to thank all personnel for their dedication and hard work. MCEA recognized public work staff with a wonderful road construction cake. Fleet Supervisor Eric Brown reminds staff that after breakfast an equipment training opportunity would be available. Public works personnel gets a refresher course on heavy equipment Wednesday morning. Animal Services Officer Jason Lemaster prepares to clean kennels. Mitchel Guzikowski, Animal Services Officer, disinfects cages in the puppy room. Animal Services Officer Sarah Rahm prepares the morning meds for sick or injured animals at Animal Services, 971 Coffman Road in Whitewater. 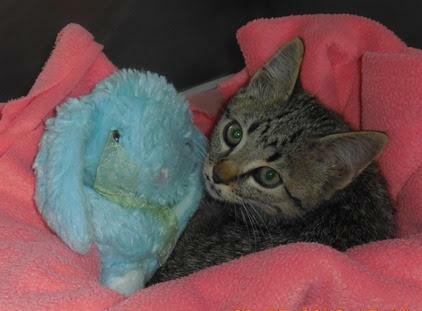 A cute kitten at Animal Services snuggles its cozy, blue bunny. The first day of election judge training begins. It’s Karen’s first time as the Mail Ballot Room leader! Karen Reiher is busy sharing information! 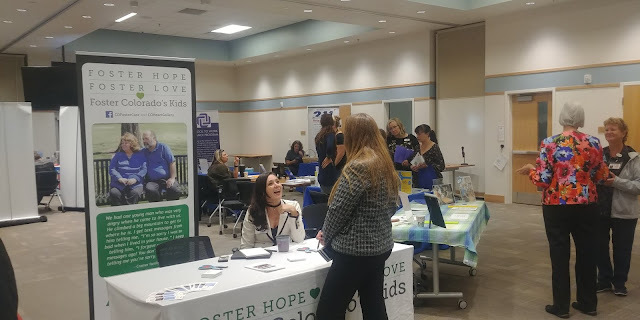 The Department of Human Services (DHS) hosted it's Annual Community Resource Fair Tuesday. 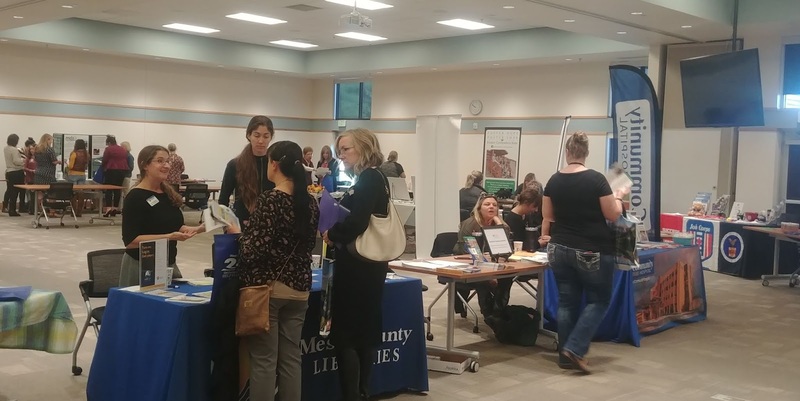 Area Health & Human Services Agencies got together to share info on their various programs with each other to help better serve the residents of Mesa County. Kylie Mayfield from DHS's Foster Care Program seems to be enjoying the morning. Mesa County Library was one of 30 vendors at the Community Resource Fair. Teresa Nees, Weed and Pest Management, took this pic of foggy conditions Thursday morning (Oct. 11), on Highway 141 near Gateway. 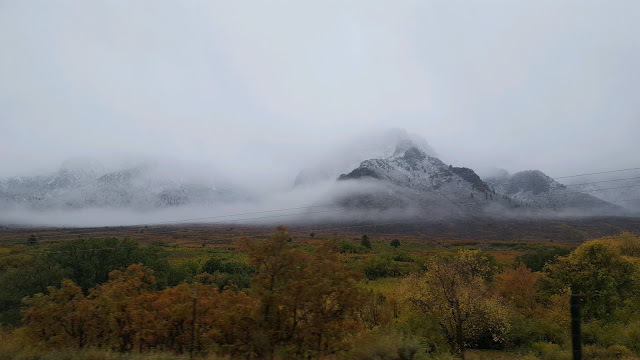 This morning, Friday, Oct. 12, Clerk to the Board, Lori Westermire, took this picture from Little Park Road of Grand Junction covered in a blanket of fog. The radio tower lights flash above the fog. Today at the Mesa County Sheriff's Office those not in uniform wore red to Remember Everyone Deployed (RED). Records Dept. Specialists stand alongside Sheriff Matt Lewis. 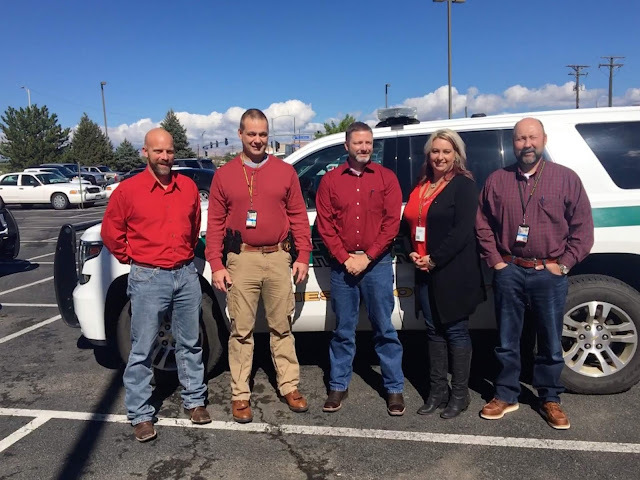 Left to Right: Undersheriff Todd Rowell, Captain Todd Sorenson, Sheriff Matt Lewis, Administrator Wendy Likes and Captain Don Hendricks were just a few of the many deputies and staff at MCSO who wore red in support of the RED Veterans Encompass, Inc.'s challenge. Many of those at MCSO are veterans and/or have family members who serve(d) in the military, which is why they participated in RED. MCSO personnel wore red today to show honor and respect for all those that are deployed. Records, Investigators and Professional Standards are pictured here. MSCO Information and Communications Manager Megan Terlecky, and deputy Brian Prunty, wear read to honor deployed service members and their families. Tim Long conducts Voter Service and Polling Center Training. There will be six teams of Election Judges deployed by Election Day November 6th! Vicki Fought, with Elections, is opening the 24-hour ballot boxes today! There are five located across the valley floor.